Happy Kitchen Sink Stamps Monday, thanks for stopping by! I'm always looking for ideas to give gift cards for the holidays, recently I purchased the Present Gift Card Holder from the Silhouette Store, and thought it would be perfect for some holiday gifts! I did alter the file a bit, as I like to add layers to my cards/projects, all pieces were cut using the Silhouette Cameo, pattern paper is from the Bo Bunny Rejoice Collection. The Ribbon pieces were embossed with the Tim Holtz Snowflake Alterations Embossing Folder, then highlighted with Ranger Gathered Twigs Distress Ink. 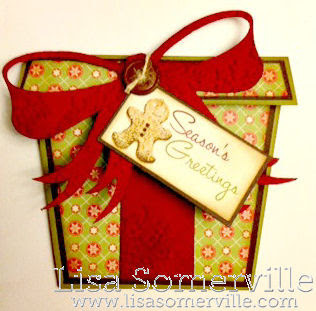 The images on the tag are from Kitchen Sink Stamps Multi Step Build a Garland and 3 Step Holly & Mistletoe set. To embellish I added a Brown button tied with Natural Jute. The sentiment is from Kitchen Sink Stamps 3 Step Poinsettia, stamped in Chocolate on Vanilla card stock, then adhered to a Espresso panel. So cute in that paper with the big red bow! Oh! That is so adorable!! Super cute, Lisa! What a fabulous presentation for gift cards!! Beautiful work! 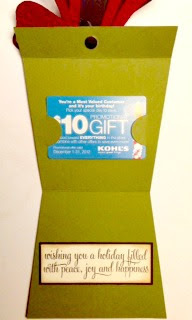 Fabulous way to give a gift card and oh so adorable! Enjoy the week! very cute, I love the huge bow! Just adorable Lisa!! Great card holder!